Forget the mall! Black Friday is when many of the top airlines offer their best flight deals for travel in the upcoming months. Below we’ve listed out the airlines offering Black Friday Flight Deals with a link to more details. Singapore Airlines Flight Deals – Reduced round-trip airfare for travel to Asia from Houston (IAH), Los Angeles (LAX), New York City (JFK) and San Francisco (SFO). Book by November 27, and travel from January 15 – June 30, 2018. Turkish Airlines Flight Deals – On November 24th only, Turkish is offering 40% off base fares. Delta Air Lines Flight Deals – Special fares and frequent-flyer offers from numerous U.S. cities to destinations in Europe and Australia. Flights from Los Angeles-Manchester, UK, advertised for $839 round trip while flights between New York JFK and the Azores start at $659. United Airlines Flight Deals – An early Black Friday deal was announced on Tuesday, offering special fares and frequent-flyer offers from U.S. cities to destinations in Europe and Australia. Los Angeles to Manchester,UK, flights were advertised for $839 round trip while flights between New York JFK and the Azores started at $659. Aeromexico Flight Deals – Look for some of the lowest fares in South America. Alaska Airlines Flight Deals – Discounts for flights to destinations including Las Vegas, Phoenix, Los Angeles and San Diego. Virgin Atlantic Flight Deals – Black Friday deals are on now! Book your return flight from the United States now for as little as $336. This offer is good until midnight on November 27th so act fast! Emirates Flight Deals – Emirates has rolled out special Black Friday fares which cover coach and business-class tickets.Sample economy fares from U.S. cities advertised in Emirates sale include Bangkok (from $949 round-trip); Dubai (from $799 round-trip); Athens (from $499 round-trip); and Delhi (from $859 round-trip). Sample business-class fares from U.S. cities advertised in Emirates sale include Singapore (from $4,499 round-trip); Nairobi, Kenya (from $4,499 round-trip); Milan (from $3,699 round-trip); and Bangkok (from $5,799 round-trip). Book by November 24. LATAM Flight Deals – LATAM Black Friday flight deals apply to over 120 destinations. British Airways Flight Deals – British Airways have started their Black Friday sales early, delivering discounts on flights. The British airline began Black Friday at midday on Thursday 22 November with discounted deals for transatlantic flights from the United States to London and flights from US to Europe. Flight deals include savings on Caribbean vacations. Hawaiian Flight Deals – Tickets must be booked between November 20-22, 2018. Departure date must be between Monday-Thursday between the dates January 9-March 6, 2019 for Economy (coach) cabin.Find Hawaiian Airlines deals here. WOW air Flight Deals – Ready for WOW air flight deals? Instead of Black Friday, WOW air is having Purple Friday! Find some of the best deals on flights to Amsterdam, Brussels, Dublin, Frankfurt, London, and Reykjavik. Deal ends November 25, 2018 with flights between the months of January-March 2019. Air France Flight Deals – Fly to London from €649 and other amazing flight deals in the Air France Black Friday sale. Norwegian Flight Deals – According to Norwegian, their Black Friday flight deal will offer up to 15% off all restrictive fares on long-haul routes (excluding flexible fares) from Europe to the U.S. and Canada. The discount will automatically be included in featured fares, no discount code necessary. The sale price is good for travel from December 3, 2018, to March 31, 2019. A blackout period applies from December 17, 2018, to January 6, 2019. The sale starts on Friday 23rd November and ends Monday, November 26th. Booking.com Hotel Deals – up to 40% off bookings. Scandinavian Flight Deals – Round trip fares for $399 between the United States and Copenhagen, Denmark; Oslo, Norway; Stockholm, Sweden and Helsinki, Finland, and $499 to other European cities including Amsterdam and Paris. Air Canada Black Friday Flight Deals – Air Canada has announced discounted fares as part of its Black Friday Worldwide Seat Sale. Search for cheap flights from most of the airline’s U.S. departure destinations. The travel sale includes international destinations beyond Canada, including the carrier’s destinations in South America, Asia and Europe. Book by November 25. KLM Black Friday Flight Deals – Blue Fly Days have started. Book now for fares with an extra discount. For example, flights to Johannesburg are currently available from $640. The offers are valid until November 23, so be quick. Finnair Black Friday Flight Deals – Finnair are offering discounted flight deals for Black Friday. Deals available currently include flights to New York from $550, fllights to Hong Kong from $600, flights to Bangkok from $640. Air China Black Friday Flight Deals – Black Friday and Cyber Monday Air China Flight Deals for 2018 center around an advertised 15% – 20% off flights from North America. Orbitz Black Friday Deals Celebrate Black Friday & Cyber Monday with early travel deals! Book your hotel room between now and November 25th at 11:59pm CT, and take an additional 10% off with promo code: GETAWAY. Travel date must be by June 30, 2019 to get this deal. Travelocity Black Friday Deals – Book your reservation at one of the hottest hotels in the most popular cities of the U.S.now! Travelocity is offering up to 40% off on hotel reservations made now through November 22nd. For an even sweeter discount use promo code : TRAVELOCITY10 to save an additional 10% on your room. WestJet Black Friday Flight Deals – WestJet has added more fare sales to their Black Friday Promotion! Book by November 23, 2018 (11:59 p.m. MT) for travel dates until June 25, 2019. Icelandair Black Friday Flight Deals – Low fares to Europe starting from $309. From select dates throughout 2019, passengers can fly from Seattle, Boston, San Fransisco, Washington D.C., New York and Chicago to major European cities such as Copenhagen, Brussels, Amsterdam, Berlin, London and many more. When is the Best Time to Book Black Friday Flights? Based on data from 2017, we predict the cheapest prices will be available at 7pm. The most expensive flights were at 1pm last year. 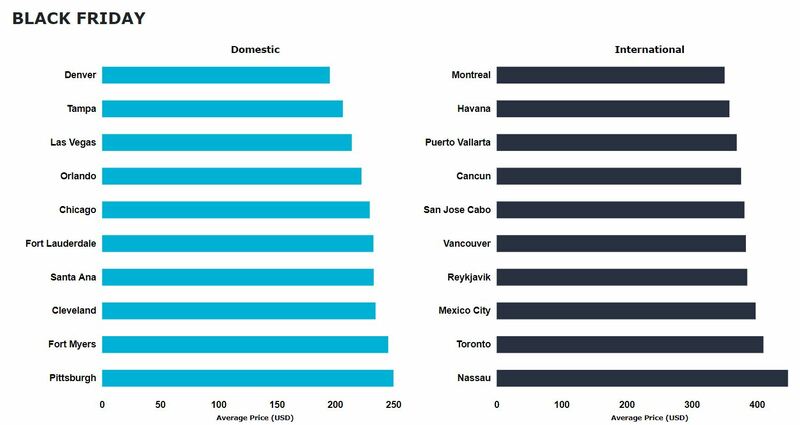 Looking for some inspiration on where to book your flight for Black Friday?Below is a list of the cheapest domestic and international destinations for Black Friday based on 2017 data. Are you wondering which cities are likely to see the biggest discounts during Black Friday’s flight deals? According to Skyscanner’s data, the below destinations saw the biggest drop in price from the United States on Black Friday in 2017. The table below shows the top flight routes for Black Friday savings based on Skyscanner’s data from 2017. The data is used to predict 2018 Black Friday flight deals. Data from 2017 shows that Black Friday was the second best day behind Cyber Monday to book International Flights. These are the top 10 international Black Friday flight deals that Skyscanner users scored last year, on Black Friday 2017. 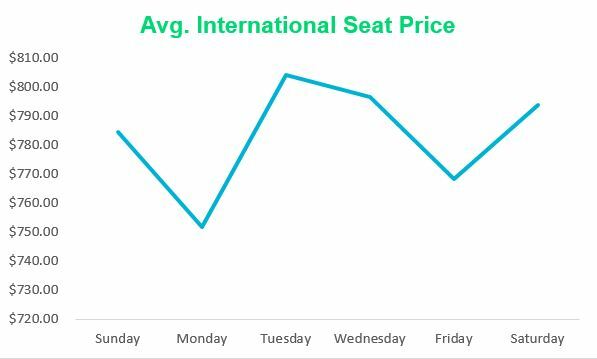 These numbers are based on our data from 2017 and are only used as a prediction for flight deals for Black Friday 2018. The difference in price is from the average yearly cost of the flight minus the cost of purchase on Black Friday 2017. 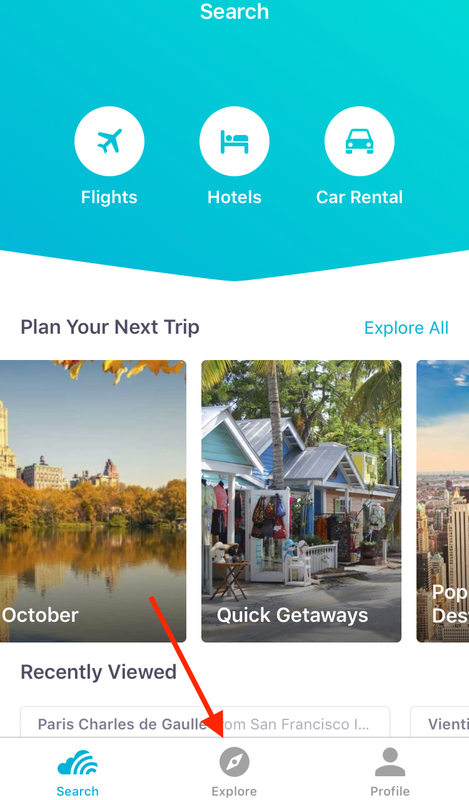 Skyscanner has plenty of tools to help you search for Black Friday flight deals, including our Everywhere Search, Price Alerts, and the ‘Explore’ section of the Skyscanner App. Search Everywhere online by inputting your nearest airport and entering ‘Everywhere’ in the destination field. If you’re flexible on dates, you can search “Cheapest Month” to find the cheapest prices throughout the year. You can also search ‘Whole Month’ to check all the dates within an individual month to find the best deals. The Skyscanner App makes it easy to Explore Everywhere. Download the app and navigate to the Explore tab on the bottom middle of the home screen. 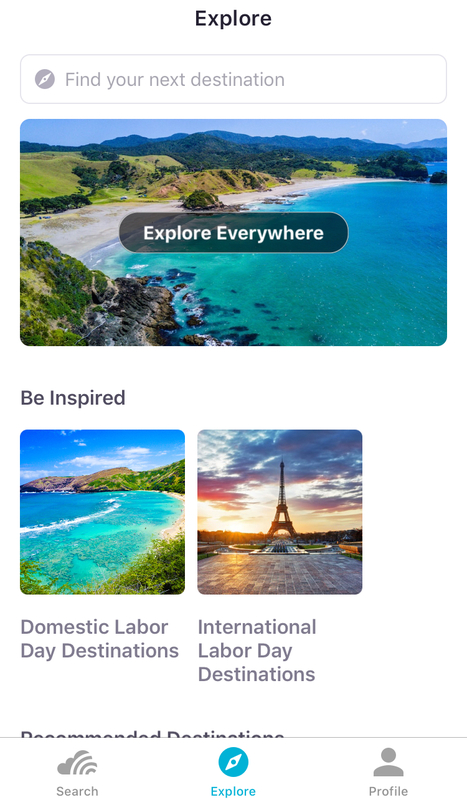 At the top of the Explore section, you’ll see “Explore Everywhere” and from here you can easily see the cheapest destinations from your origin city during your dates of choice. Search ‘Anytime’, ‘Whole Month’, or specific dates of your choosing, and the app will show you a list of the cheapest destinations available. Downloading the app is the best way to get instant notifications when flight prices drop. Download the app before Black Friday to set up Price Alerts to all your favorite destinations. 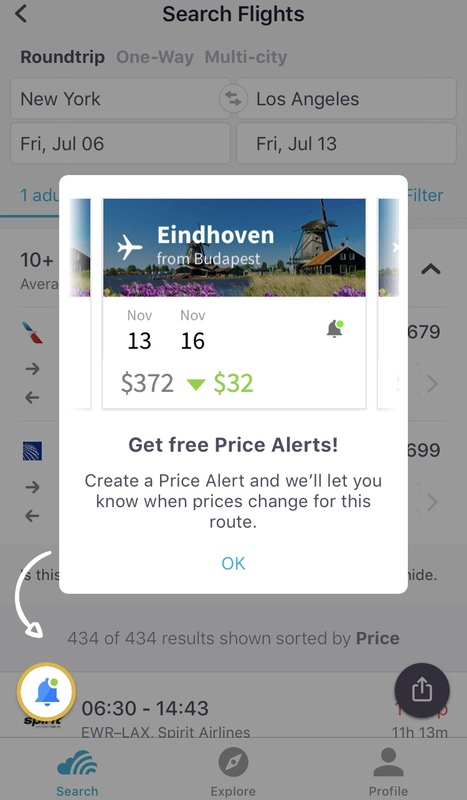 When you set a Price Alert on Skyscanner, we’ll send you a push notification to alert you when the price changes on Black Friday or Cyber Monday. If you’re interested in traveling over Black Friday and Cyber Monday, check out our article on the best time to book your flights. Consider flying out of further-away airports; they may have bigger discounts on certain routes. If you have an airline of choice, keep an eye on their website throughout Black Friday/Cyber Monday. Sign up for airline’s newsletters as they’re likely to announce potential Black Friday flash sales via email. Our deals experts have also scoured the internet for the best hotel deals live right now. Don’t lose time and find your Cyber Monday hotel deals for 2018.